If you consider yourself part of the “RV lifestyle”, you’ve probably heard of an RV inverter. 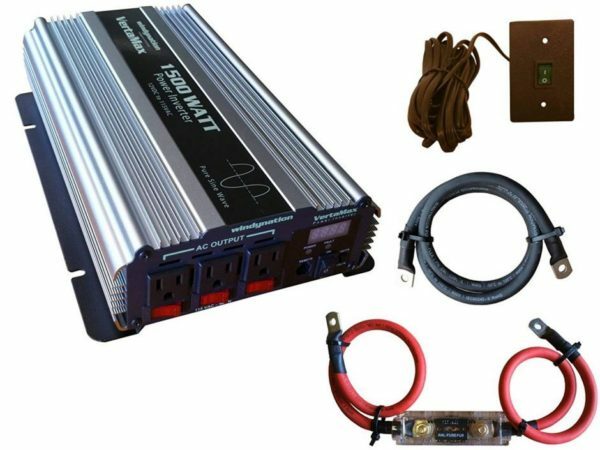 You may even have been told you’ll need one to sufficiently power your RV. As important as these devices are, choosing the right RV inverter for your needs can feel overwhelming. Before you embark on any adventures, you want to be sure that you’ve got the best RV inverter on the market. Luckily, we’re here to help—these are our top choices. Before you purchase an RV inverter, it’s always important to know what attributes you need in one. While some inverters are designed for high-powered, luxury RVs, others are simple and functional. A common mistake that some people make is mixing up RV converters and inverters. While these devices may sound similar, they do very different things. There are two kinds of voltage powering your RV: DC voltage (12V) and AC voltage (110V). The converter’s job is to convert AC voltage (110V) into DC voltage (12V), which supplies power to different parts of the RV—like your lighting and water pump. An inverter does the opposite. It turns DC voltage (12V) into AC voltage (110V). Doing so allows you to operate other parts of the RV without plugging things in or relying on a back-up generator. For anyone who enjoys a fully-operational RV without the constant hum of a generator or complicated set-up, RV inverters can be extremely useful. There are two major kinds of RV inverters—pure and modified. The difference between these two types has to do with the waveform they generate, but what really matters is how they affect the power in your RV. While generally more affordable, modified sine inverters may not work perfectly for all appliances. At times, they can cause interference with all of your favorite gadgets—including TVs, radios, and computers. However, if you’re only looking to power basic appliances like lights, power tools, non-digital microwaves, and ovens, it might be worth it to invest in a modified sine inverter. If you need to power your favorite entertainment devices—such as computers, TV or radios—it might be a smarter choice to opt for a pure sine inverter rather than a modified one. While it might be less economical, pure sine inverters will produce a smoother, cleaner output that will power anything you need it to. One important thing to consider when purchasing an RV inverter is its size. That doesn’t mean the physical size, but the wattage your RV inverter will produce. RV inverters come in a variety of different wattages—from 1000W to 5000W. Your wattage needs will depend on the number of appliances you need to power and the amount of energy they consume. DVD players, for instance, typically use up to 100 running watts of power. Once you figure out a rough number of watts you typically use, you’ll be able to determine how much power you need in an RV inverter. 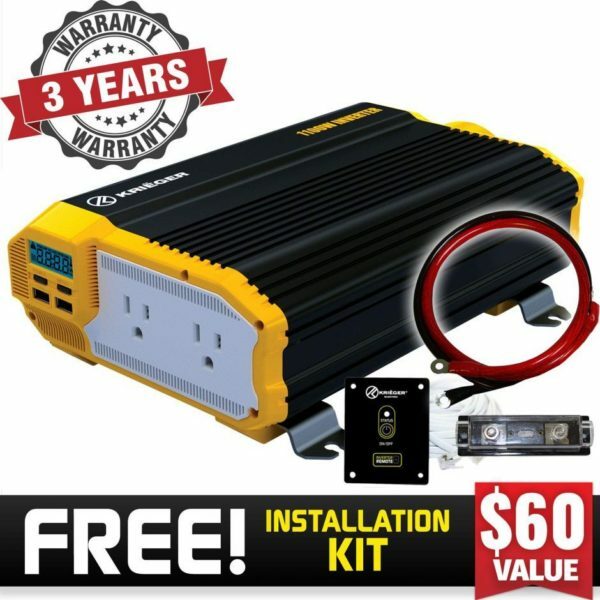 If you’re only using 3000 watts, there’s no reason to purchase a 5000-watt inverter. In fact, doing so will just put unnecessary strain on your system. Beyond modified and pure sine waveforms, some inverters may also be referred to as lightweight or heavy-duty. Lightweight inverters are usually used in cars, SUVs, or mini-vans. While you could use a lightweight inverter in an RV if you wanted to, these devices are not as well-suited for that. Lightweight inverters are generally low-wattage and can power phones, cameras or laptops. Heavy-duty inverters, on the other hand, are what’s typically inside an RV. These higher-wattage devices are designed to power up kitchen appliances, radios, and TVs. There’s even a third class referred to as medical-grade inverters, but unless you’re trying to power an entire entertainment system, you won’t need to worry about these. When you’re on the road, the last thing you need is for something to happen to your RV inverter. This is only complicated by the fact that, unless you’re near a major city, it might be difficult to obtain a new inverter until you get back. One key consideration to take into account when purchasing an RV inverter is its durability. Some manufacturers include special cases or thick outer coverings that will better protect the inverter from possible damage. Before any self-installation happens, you should always read the instruction manual that comes with your inverter. Every product is slightly different and might require special procedures for it to work correctly. The first thing to do is secure the inverter into place. Without proper support, the components inside the inverter can get damaged. Once you’ve connected it to a secure support, you’ll need to wire the unit directly to the battery that it will be drawing power from. Most of the time, this will be the coach battery, not the chassis battery. From there, it’s important to closely follow the instruction manual for specific directions about wiring and grounding the unit. 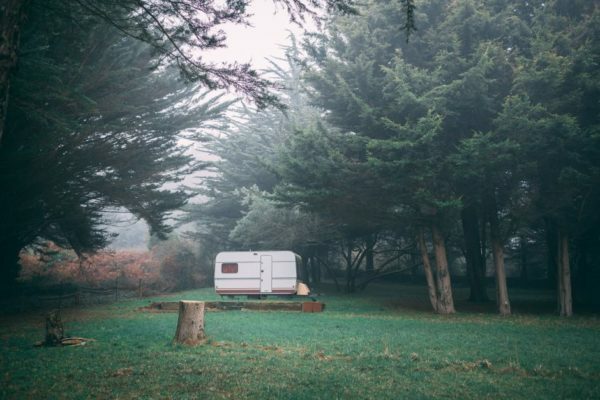 You might know what to look for in an RV inverter, but weighing the pros and cons of different options can still be confusing. Here are our favorite choices currently on the market. If you’re ever in a power outage, the Power TechOn inverter might just save the day. Since its a pure sine inverter, this device will work with all appliances, and provide a stable, continuous flow of power. With 3000-watts of power, this inverter should be able to handle a large number of appliances at once. Keep in mind that it does also provide 6000-watts of surge power with low harmonic distortion. This inverter is designed to be lightweight and portable. It’s less than ten pounds and can be transferred from an RV to boats, cars, and other vessels. The Power TechOn inverter has a large array of protection features too: this includes thermal protection, overload protection, a low voltage protection alarm and under voltage safety mechanisms. If there is an issue, the inverter has an LED light that will signal what the problem is. With your purchase, you’ll also get red and black cables with ring terminals, 3 AC sockets with a USB port, a remote switch that reaches up to 15 feet and an instruction manual to clear up any confusion you might have. For anybody who’s unfamiliar with RV inverters, this device might be the perfect introduction: the various accessories and starter pack are great for beginner use. You might not need 3000-watts of power, in which case, the 1100-watt KRIEGER power inverter might be the better choice. This device is a modified sine inverter designed to run a variety of appliances. While it might not work well for your laptop or flat-screen TV, it can sufficiently power your lights, power tools, and basic kitchen appliances. As an automotive inverter, this device might work best on smaller, functional RVs rather than large luxury vehicles. The device includes an LCD display to indicate the output wattage, input voltage, and battery level. There’s also a variety of protection features too: overload protection, temperature, and short circuit protection. To keep the inverter cool, there’s also an ultra-silent thermal fan. For a little more convenience, you can use the remote control to switch the inverter on or off. It also comes with an in-line fuse, 4-gauge cables capable of reaching up to 3 feet, 2 AC outlets and USB ports powering at 2.1 amps. Another advantage of the KRIEGER inverter is its 3-year warranty. If you need to replace defective parts or have the inverter repaired, you can contact the manufacturer. The VertaMax inverter has 1500-watts with a 3000-watt surge. This device is a pure sine inverter, so you can expect it to work well with sensitive appliances like laptops, TVs, or radios. On the inverter, there are 3 grounded AC outlets that can be used for household items. Each outlet also comes with its own circuit breaker. The LED display will tell you the DC battery voltage as well as the current AC power consumption. This display is particularly useful in helping you decide how many devices you can hook up. If it looks like you’re using almost 1500 watts, you won’t want to add anything else. Along with the inverter, you also get 2, 3-feet gauge battery cables that come with cable lug terminals, and a remote to switch the inverter on and off (this remote works best within a range of 17 feet). There’s also a 150-amp ANL fuse and an ANL fuse holder to go with it. One convenient feature of this inverter is that everything you need to install it comes with the purchase—you don’t need to buy anything else separately to use it. If the inverter becomes damaged, the device also includes a 1-year warranty. With 2200 watts and a 4400-watt peak, the Giandel inverter is a happy medium between high and low wattages. For people looking to power some higher-energy appliances but not be overwhelmed by wattage, this might be the right choice. 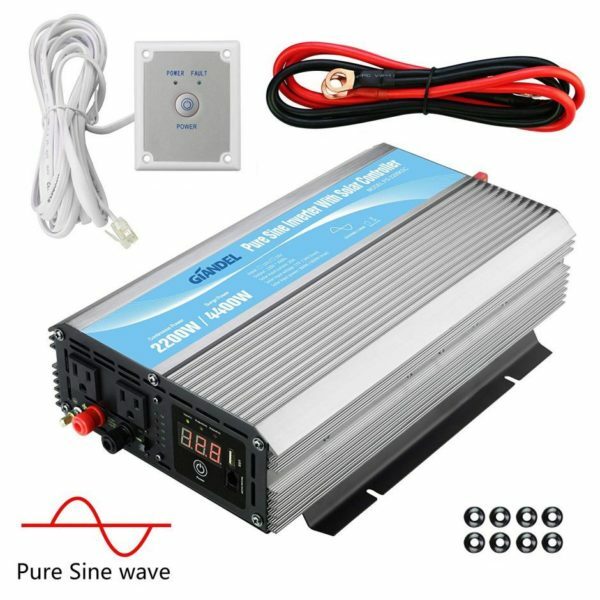 It’s a pure sine inverter, meaning that it should have limited interference and work well with most appliances. 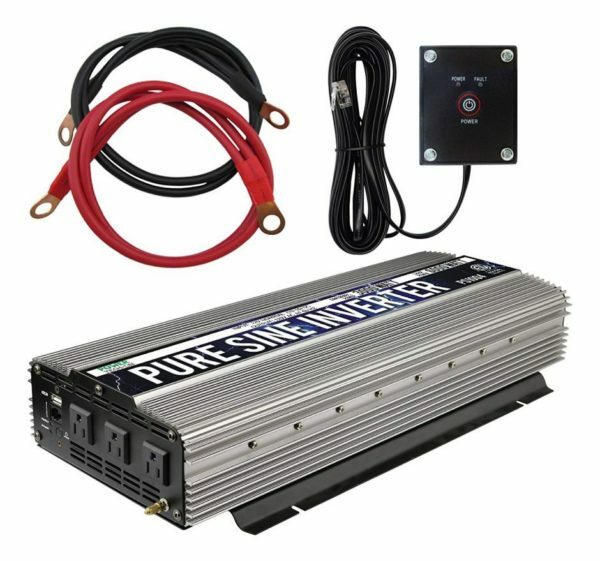 One unique feature of this inverter is its solar charge control: you can hook up a 300-watt solar panel to charge your SLA or GEL battery. There’s even a battery voltage indicator to tell you how much charge it has left. In larger RVs, you might not always be crowded around the inverter. In this case, the remote control can come in handy when you want to switch the inverter on or power it off. This device also has plenty of protection features, including over/low voltage, overheating and polarity reverse protection. While it might be a little heavier than its competitors, the aluminum alloy housing may prevent damages from a bumpy ride or accidental fall. However, if something does happen to your inverter, it can always be replaced or repaired: purchasing this item also comes with an 18-month warranty. 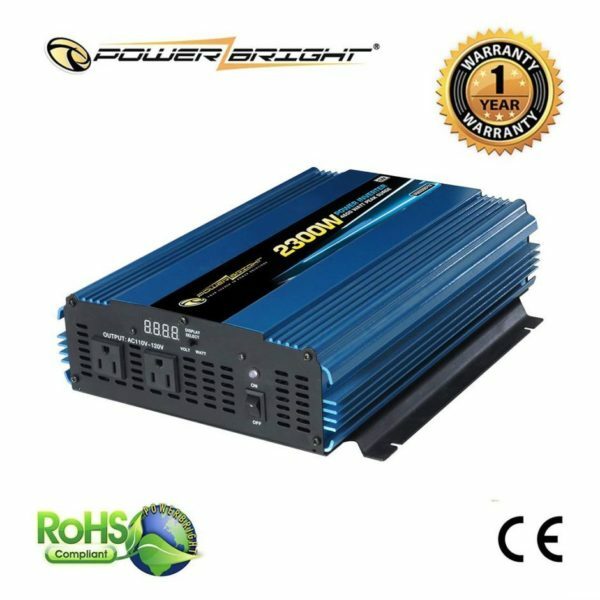 The PowerBright modified sine converter has 2300-watts of power with a peak of 4600 watts. If you need it to, this inverter will plug directly into a 12-volt battery (which you can then use to power your electronics). At 11 pounds, this inverter is not as lightweight as some competitors, but it makes up for it in durability. You don’t need to worry about damaging this inverter too easily—the anodized aluminum case provides more protection, allowing you to take it on all your adventures. The built-in cooling fan may help prevent the inverter from overheating too quickly when it is in use. To turn it on and off, all you need to do is flip the switch. For charging smaller electronic devices on the go, there’s a cigarette lighter on the side, and 2 3-prong AC outlets. Besides external protection, the device always has a few internal protection features too. The low-voltage alarm will alert you of any problems, and there’s also an automatic shut-down in case it overloads or short circuits. If you’re nervous about power usage, you can always check the LED display. This will show you the input and output wattages so that you can keep track of power consumption. While each of these options have their own benefits, the VertaMax Pure SINE Wave Inverter is the best RV inverter for your adventures. Not only does it contain a higher amount of wattage, but it’s designed to power all of your favorite electronics. Unlike modified inverters, this one is meant to provide a continuous, stable flow of power that won’t cause interference. This inverter is a blend between durability and lightweight design: it won’t be a chore to deal with, but it also won’t break too easily either. The next time you decide to take your RV out for a spin, you’ll have the best RV inverter to fuel any appliance you need.